I have extremely mixed feelings about this. Yeah, even considering how much of a fan I was - and always will be - of the original. 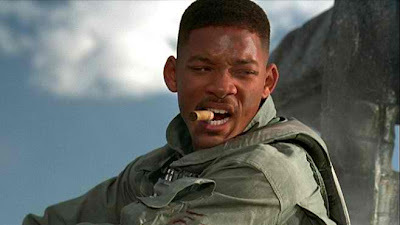 1996's Independence Day was a unique product of its era. It should remain as much. At the same time it was such a great concept now tied down to being so dated a film that it's one of the few movies that I could see a reboot/remake being in order. Just as long as those eyeball-goggling practical effects make a return. A tip o' the hat to this blog's good friend Drew McOmber for passing along news of this... thing. I like the idea...for a couple of reasons. Like you, I thoroughly enjoyed the first film. First things first...get Will Smith back. Not only get him back but make him the President of the United States. The time is right for it. It's been 16 years since the last film and probably another 3-5 before we actually see a sequel, so that's almost 20 years later. He saved the day (along with former President Bill Pullman and Randy Quaid), so he's a national...no world hero. Also, get Jeff Goldblum back. He can be kind of 'the underground consultant' for Smith's President Hiller. No need for any of the remaining cast to come back...well, except for Judd Hirsch because he's always welcome. One thing I don't like - the post conversion 3D. Bad idea...just film it in 3D.